Navsari 220 mms, Upleta 214 mms, Umergam 154 mms, Kutiana 150 mms, Bardoli 140 mms, Jamjodhpur 133 mms, Doraji 130 mms,s, Jalapor 127 mms. the "activated" off shore trough,embedded with 2 UACs. Rainfall map of Monday shows the rainfed regions. The incursion of strong moisture laden winds, gave rise to violent thunderstorms in the interiors of the 2 states (Mah. and Guj.). 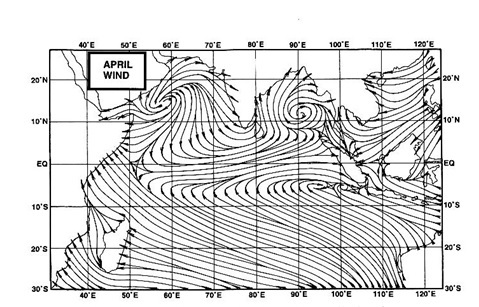 moves, it should weaken the off shore trough, or in other words "take the steam off" the trough, and bring it back to a "normal'' trough strenght. For rest of western Mah. region, a decrease in rain from Wednesday, as the moisture level drops due to the vanishing of the UACs. As yet, I do not foresee any bay low forming till 3rd Sept at least.Possibility on 4th. However, the monsoon axis remains in its normal position. Due to vanishing of the off shore trough in the east, a sudden decrease in rainfall for the states of T.N./Karnatak and A.P. from Tuesday, till the 3rd. 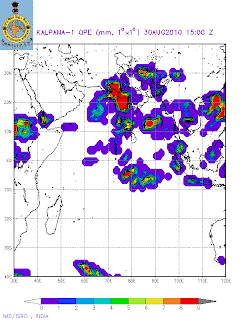 In fact rains could be very isolated rains in these regions. Chennai can get some convective rains in the afternoon/evening on Tuesday, and clearing up next 3 days.For Bangalore, just some drizzles till 3rd.Sept. Northern region will also have subdued rains, next 3/4 days. Sunday/Monday has measured up 200 mms at S'Cruz and 100 mms at Colaba, including 38 mms (Colaba) and 63 mms (S'Cruz) on Monday. Vagaries had estimated average 130 mms for Sunday thru Tuesday. From Tuesday, Mumbai rains will decrease, and drop to 15 mms range per day from Wednesday. Tuesday should guage up about 40 mms of rain in Mumbai,with decrease in intensity towards evening.